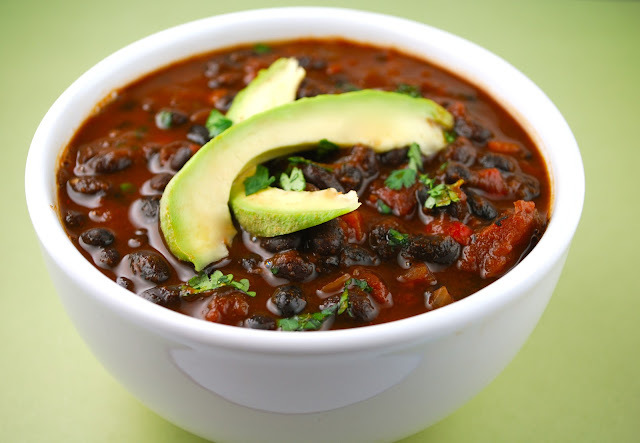 Enjoy this healthy & hearty chili recipe! Power up those taste buds for pennies!! Heat oil, and sauté onions, peppers, and garlic. Sauté until tender for 14 minutes. Transfer mixture to a plate. Add beef and pork and sauté 10 minutes or no longer pink. Return onion mixture, add tomatoes with liquid, add chili powder, jalapeños, and cumin. Season with salt and pepper if desired. Cover and simmer 1 hour until meat is tender. Add black beans and red wine to chili. Simmer until thicken and tender. About 30 minutes. Adjust seasoning. Ladle into bowls with garnish of choice.